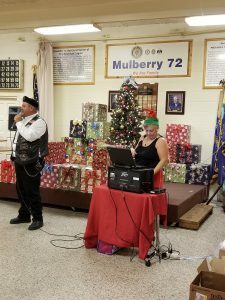 A big thanks to the members of Mulberry Memorial Post 72, American Legion inc. who hosted Christmas in July for our Veterans. Our day began with a motorcycle escorted drive to the Post home where we were greeted by the members and treated to a wonderful homemade Christmas dinner. We were entertained by Holly Rae, the veterans received haircuts from Toni Stringhham, and even a visit from Santa with lots of presents. Thank you so very much for treating our veterans to a wonderful outing!